Great question! Payable is a platform for tracking work, paying workers, capture W-9s, and file and deliver 1099s to contractors. 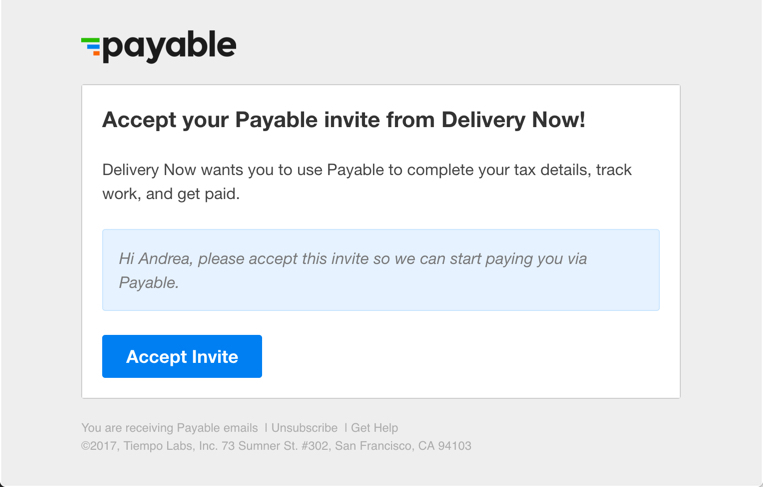 This article should give you a basic rundown of how to get set up to receive payments, how to enter work, and how Payable automatically generates an invoice to your contracted employer, which they then pay directly through the app. You’ll then provide all of your payment and tax data. Learn more here - My Company Invited Me To Payable - What Happens Next? Work can be entered directly through the app and user interface (UI) or via an integration with your company's other sources of work data. Because Payable is a flexible platform for businesses of all kinds, the actual Work Types (i.e. hours, expenses, mileage, projects, tweets, anything!) your company is using will vary. Not all companies enter work directly into the app either. Many customers push work data into Payable from other apps and may have you in what Payable calls "Read-only Mode." If you're entering work directly into Payable, this can be done by clicking the big "+" in the upper right which will drop down a menu of Work Types. OR, you can go to the "Work" page and select the Work Type you want to track (i.e. the Hours, Deliveries, Projects, etc.) and add work from there. If you're tracking time, you can also use the "Start Timer" button to track your time even more precisely. When you stop it, a new work entry will pop up just like adding hours in bulk, so you can apply services or add notes or add photos. IMPORTANT: Make sure you understand from your contracted employer exactly how they want you to track work and the specific Work Types you will be using. Payable automatically generates invoices as work is added to the app. Adding hours or any other kind of work will automatically accrue onto a digital invoice that your contracted employer will be able to pay. Click into the "Unpaid Work" section of the Payments page to view a more complete and detailed version of the unpaid invoice. Your contracted employer also has this same view so they know how much to pay you! If you need to edit any of your unpaid work entries this can be done from the Work page. Learn more here - How Do I Delete a Line Item from an Invoice? When there's money under "Unpaid Work" (orange), it means that your contracted employer hasn't initiated a payment to you yet. IMPORTANT: Make sure you understand how frequently you are supposed to be paid. Every business is different and they are the only ones who can initiate a payment to you. When the company you're working for has sent your payment, you will get an email notification from Payable with the total amount owed and the expected date of deposit. This information is also available to you within the app or on the web by clicking "Payments in Process" (blue). Depending on your contracted employer, Payable takes 3-5 business days to deposit funds into your account. When your payment has been deposited in your checking bank account, Payable will send you another email alert, and your payment will show up in "Completed Payments" (green) where it can always be retrieved for your records. IMPORTANT: If you have questions about the payment amount or details, please get in contact with your contracted employer.